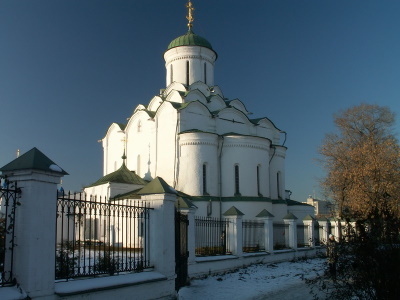 The White Monuments of Vladimir and Suzdal embraces eight medieval limestone monuments of Zalesye. The Church of Boris and Gleb in Kideksha (1152, with later modifications). For a brief epoch in Russia's long history, Vladimir and Suzdal were the heart of Russian culture and rule, and the White Monuments of Vladimir and Suzdal remain as symbols of this stage in Russian history. Both cities lie approximately three hours east-northeast of Moscow, though I have only seen the city of Vladimir, and that many years ago. Vladimir was the capital city of Russia in the 12th and 13th centuries, before the Mongol invasion shifted power to Moscow. On a bluff overlooking the Klyazma River Vladimir's Assumption Cathedral, also known as the Dormition Cathedral, was constructed in the 12th century to serve as a mother church for Russia. This grand limestone church was expanded over time, and was very impressive when I saw it, with its belltower and five golden domes and its richly painted and gilded interior. 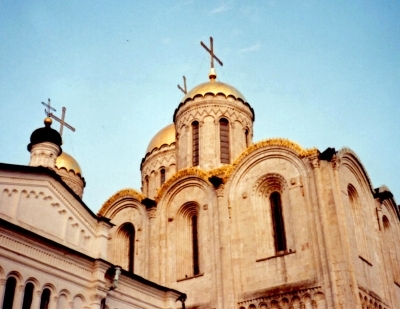 Grand Princes were coronated in Vladimir's Assumption Cathedral until the 14th century, when coronations were moved to the Assumption Cathedral in the Moscow Kremlin, which was based on Vladimir's cathedral. Also in Vladimir are the small and exquisite Saint Demetrious Cathedral and the impressive Golden Gate, which dates to the 12th century. I regret not having had time to visit Suzdal or the famed Church of the Intercession on the Nerl, but Vladimir had quite an impressive collection of monuments from Russia's history. Logistics: Vladimir can be reached by train or by a three hour drive from Moscow, and the city is walkable, although public transportation, to include buses and trolleybuses, is available. Tserkvas of Vladimir and Suzdal are among the best preserved sacral buildings in Russia. Even during Stalinism they did not suffer that much (although many of numerous tserkvas in Suzdal were closed or destroyed, still most of them survived). Now these two places are probably the most interesting part of Golden Circle not only for WHS fans. I arrived early in Vladimir and took the first bus to Suzdal. Fortunately, in the morning the site was not as crowded as it was some hours later, so I could praise the beauty of the town and take photos uninterrupted. Suzdal is like a large skansen, absolutely unique place in Russia and all former Soviet Union. All important tserkvas and monasteries are within a walking distance, but seeing them requires some time and physical effort. For me even more important than visiting particular buildings (inscribed or not) was just wandering around the town and admiring its landscape. On the practical side, the journey from Vladimir to Suzdal takes 1 hour, but the bus station is around 2 km from the town centre. Direct buses extend their route to the center and I recommend using it (there is extra fee of about 20 rubles). Indirect buses (to Ivanovo) stop only at the bus station. Unlike Suzdal, Vladimir is a large city, very well connected with major Russian cities. The main monuments are not so far from the train/bus station, so you may walk or take a city bus/tram. The number one is undisputedly Assumption Cathedral with original frescos by Andrei Rublov (on a side, to take a good background I strongly recommend watching Rublov by Andrei Tarkovski before going to Golden Circle) and with beautiful iconostas founded by Catherine the Great. Entrance fee is 100 rubles and I suggest going there with a guide. Another listed cathedral, St. Demetrius, is much smaller and poorer inside (which is in fact closer to original, as orthodox churches were rather ascetic in XIIth century). The third inscribed building in Vladimir is the Golden Gate, the most significant remaining of the city walls, which gives a view of how they looked several hundred years ago. Famous Church of the Intercession on the Nerl in Bogolyubovo is easily reachable from Vladimir by direct bus 152 from the city centre. Then I had to walk around 1.5-2km on the meadow without any shadow, which in full July sun and temperature about 35 degrees was not very pleasant. During my visit the track was full of tourists, so it was not even possible to make a good photo of the church in this 'iconic' surrounding. As a result, unlike other reviewers, I did not like that particular church, although I am aware that it was the inspiration of most of newer tserkvas of that region. Suzdal is what I would consider the crowning jewel of the Golden Ring around Moscow. Historically, a prosperous trading town on the way east, the Transsiberean Railroad was built via Vladimir to the South and Suzdal became somewhat of a backwater. As such it has kept much of the historic town center and gives a look into the Russian past. The town is dotted with wooden Russian buildings and houses a staggering amount of monasteries and churches. Several of these are lined along the local river banks giving an impressive panorama. And of all the murals I saw in Russia, St Euthymius in Suzdal certainly features in the Top 2, the sole other contender being in the Mirozhsky Monastery in Pskov. I nearly decided to skip on Suzdal for logistical reasons (no train connection, local bus, ...). Thanks to Jarek for his feedback in the forum that made me go anyway. And I do agree: Suzdal is one of the loveliest places in Russia. Apart from Suzdal the site also covers monuments in Vladimir and Bogoljubowo. The Church of Perfection on the Nerl (see picture) in Bogoljubowo is probably the most iconic image of the inscribed site. The small white chapel is beautifully embedded into a large wetland plain with a pont stretching around it. It's a great walk and photo opportunity. Vladimir meanwhile is less impressive, but being the logistical hub for the region you will probably pass through anyhow. The opening hours of all the sites are not aligned. Some close Wednesdays, other Tuesdays. In my case I wasn't able to visit a church in Vladimir and the Kremlin in Suzdal. The upside is that you can be sure that some sites will be open when you come to visit. Vladimir has a direct express train connection from Moscow (2:50h). You can easily visit the sites on a day trip. Be advised, though, that you need to reserve early as the train is rather popular. From the bus terminal directly in front of the train station you can get to Suzdal. To get to Bogoljubowo take the bus at the Golden Gate (Bus 152). The bus station in Suzdal is on the outskirts of town. Either take a long walk or one of the local busses. To get to the Church of Perfection in Bogoljubowo you need to cross the rail road tracks. This is only possible at the rail station. Vladimir is a medium size city, with some fabulous monuments to see, like the golden gate and city's kremlin, and also some churches and fortresses to see, but Suzdal is way better than Vladimir. Suzdal is a village northwards from Vladimir, but it has got incredible cultural and historical wonders. From all its churches and monasteries to even a wooden-architecture open air museum, and not to forget all the fortresses. It is the only place in the world where I have seen more monuments than houses, and some houses are also incredible, they are decorated in such a very nice way. Visited all inscribed sites last year in October (awful weather, cold, raining almost all the day long) but the buildings are amazing. 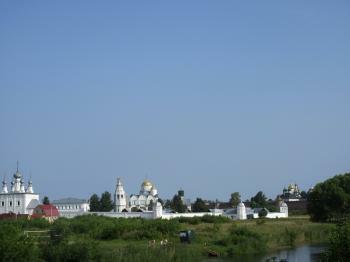 If you want to see the real old Russia Suzdal is the ideal place (small city - around 5-6 th. citizens with some 80-90 medieval churches, 5 walled monasteries and lots of old buildings). 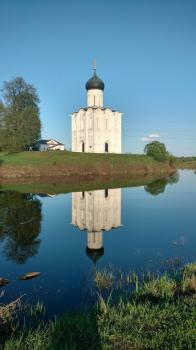 Kideksha lies some 10 km from Suzdal. Vladymir is a big city but the inscribed sites are well preserved. In Bogolyubovo (14 km of Vladymir) there are 2 sites: castle that now is a part of later built church and Church of the Intercession on the Nerl - beautifylly situated on meadows. Golden Horde: "In 1262 a rebellion erupted in Suzdal, killing Mongol darughachis and tax-collectors. Only after Alexander Nevsky begged Berke not to punish the Russian people and the Vladimir-Suzdal cities agreed to send large sum of payments, the Golden Horde aborted its punitive expedition." Named after individual people: Regarding Vladimir there are 2 views. The "orthodox" one (Wiki) "attributes the founding of the city, and its name, to Vladimir Monomakh, who inherited the region as part of the Rostov-Suzdal principality in the 1093. In 1958, the 850th anniversary of the city foundation was celebrated, with many monuments from the celebrations adorning the city squares." The newer one is that "Scholars reinterpreted certain passages in the Hypatian Codex, which mentions that the region was visited by Vladimir the Great, the "father" of Russian Orthodoxy, in 990" and that the city foundation date was in that year.